I have a pivot view that has the date columns along the x-axis, is there a way to sort the columns in descending order so the latest date appears as the left most column. Below is the screenshot of the original report where it only orders the dates in ascending order. Omniscope assumes here you are dealing with a time series and chronological order is default. using the little hand at the end of each row drag the date values to create the desired order. This field can now be used for the Pivot view. But I am not sure about the instructions after this. Since this is a pivot view, the dates can change each day (e.g. new dates get added and old ones get removed) therefore the report needs to dynamically order the dates in descending fashion each time without setting up any manual sort orders. Would this be possible? Now you can load it into Omniscope and create a Pivot view, where on either axis both fields are used in cross tab: [Desc Date] and [Date] . 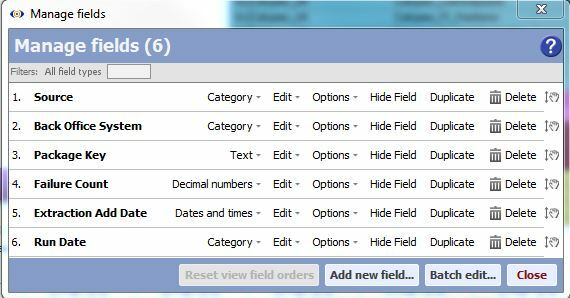 The order field should be the first on the list, so Omniscope will use it to create order. e.g. would this be the correct syntax to rank the dates from 1 to 10? Alternatively you can use DenseRank function. Following posts will offer help with syntax through demos.